The Sixth Ward: So is Garrett's coming or not? So is Garrett's coming or not? 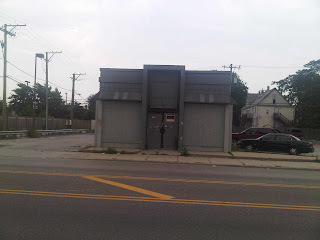 In part two of Worlee's drive around Chatham with Joe Zekas of YoChicago.com, he mentioned that Garrett Popcorn Shop is coming to 87th Street. I queried him about where it's going to be on 87th and he stated that it'll be at this former KFC location on 737 E 87th St right next to the PNC bank branch on the corner of 87th & Cottage Grove. If you've been reading this blog during the course of the 2011 aldermanic campaign you should've seen a scan of a mailer from the previous Alderman touting Garrett as one of those businesses that are coming into the community on her watch. I applauded the potential but had my doubts as it was noted in a campaign mailer. BTW, Worlee stated that Garrett's (man I wish I had his sources) was coming this fall in either September or October 2011. Although former Ald. Lyle's flyer stated the summer of 2011 for the anticipated opening. I took this picture of the former KFC on Monday morning. Not sure how long it takes to set up a new business in an already erect building, but there doesn't appear to be anything new with this building yet. At least it does have a decent parking lot. Who knows if people can get their popcorn through the drive-thru. My source was the Alderman's announcement at his last Meet and Greet. Yes, the project started under the Lyle administration, the representative from Garrett's has been coming out for about a year. Although we have a new mayor we still live in Chicago. Plans and Permits may be one department but they are mutually exclusive, so the best intentions don't always work out time wise. Also, Garrett Popcorn responded to our Twitter account with this message: "@TheSixthWard Yes. Was actually planning to blog about that this week, thanks!"